Marks were rarely used on early pottery in China. The earliest such antique marks were either incised or impressed. 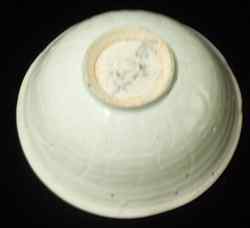 However, even the later emerging porcelain was seldom marked before the Ming dynasty (1368-1644). Researchers in China are suspecting that most if not all porcelain with marks, whether from the Song or Yuan dynasties, are not authentic. Archaeological excavations done on known kiln sites from these periods did not produce any marked shards. There may only be a handful of them known for the Yuan and Song dynasties. However, currently there is no consensus yet as to whether items with marks are really authentic or if they could be fakes. There is not enough factual proof as of today for either view. And there are much too few marked items from that period, overall, to allow for definitive conclusions. The real use of marks on Chinese ceramics started only in the early Ming dynasty (1368-1644). And they were mostly limited to porcelain. Marks were always much less common on earthenware. The only earthenware items that can be expected to consistently show such marks are the pottery items made of "purple sand" clay, from the Ming dynasty onwards, especially the tea wares made in Yixing. With the Yixing (zisha or 'purple sand' teapots) non-marked items are comparatively rare. The reason for this is probably that more often than not the tea wares bear the marks of the master craftsman or artisan, while on other pottery wares mostly the location or name of the manufacturer were never mentioned. Actually, before the Ming dynasty all types of pottery remained unmarked as a rule. Earthenware with marks is seldom found in any era. The beginning of more frequent marking is attributed to the Yongle reign (1403-1424) of the Ming dynasty. But, even then the use of marks was initially sporadic; the large majority of Chinese pottery still remained unmarked. Black, hand-written text found on the unglazed bottom of some older ceramics. Often personal items were buried with the deceased. The date and name of the deceased can be written with a brush in black, mostly on the bottom of the object. Applied on the clay or unglazed bottom, the date or record of purchase of the item is noted, also in black ink. This type is occasionally also encountered on later wares up to the Qing dynasty; but mainly on items with an unglazed bottom. The black ink has now faded. The ink indicates that this item is most likely a burial object. Often the ink has faded and the characters are difficult to recognize. Some glazed plates, dishes and bowls (only) do have characters or character-like symbols in the glaze, either on the inside, outside or on the bottom. They look as if they were scratched. However, the lines were actually made by punching many small holes into the glaze. These characters or symbols signify ownership of items borrowed for communal use, and are not pottery marks proper. The markings just served to identify ownership of plates and bowls borrowed for communal use, large scale celebrations like wedding dinners, festivities, etc. Such markings are mainly found on more simple plates and bowls. Clearly visible character in the glaze, punched with needle tool. This sort of marking is designating ownership.